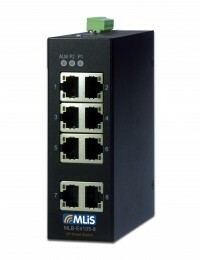 MLiS MLB-E4112-8-G / MLB-E4113-8-G-F provides 8 * 10 / 100 / 1000M Ethernet ports to fulfill the needs of the rapid growth of communication traffic in industrial network. MLiS unmanaged series are designed for supporting standard industrial applications without complex setup to make the network truly plug-and-play. With the QoS and traffic storm control, MLiS series switches are able to provide the high reliability user experience in the complex network.